Metallica and Vans have joined forces to present the new Vans x Metallica 20th Anniversary Half Cab Pro, part of a year-long celebration of the 20th anniversary of Steve Caballero's signature shoe with touches of “Kill 'Em All” art and lyrics on the black classic shoe. 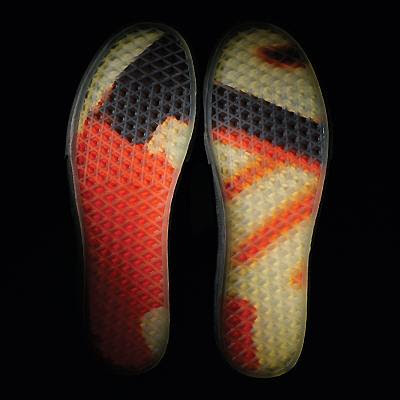 The design features exclusive Vans x Metallica x Steve Caballero labeling, lyrics from 'Motorbreath' embossed on sides (“Those people who tell you not to take chances” / “They are all missing on what life’s all about”), and a unique clear rubber sole with the “Kill ’Em All” album artwork showing through. In 2013, fans can look for a collection of four shoes, each one designed by a band member and released first to Met Club members in January. In March, Metallica and Vans will be celebrating the 30th anniversary of “Kill 'Em All” with two new shoes, the classic Vans slip-on and the SK8-Hi, each covered with the KEA album graphics. "I've been wearing Vans on stage my whole freakin' career (and way before that! ),” says bassist Robert Trujillo. “Whether I'm walking the streets of Venice or San Francisco, Vans provides the funk in my stride!" "To have Metallica, my all-time favorite metal band, collaborating with me on this 20th-anniversary Half Cab shoe is an honor and a dream come true," said Vans' skate legend Steve Caballero. "I'm very stoked that Vans is working with such a legendary band and the Half Cab is just the beginning." The Vans x Metallica 20th Anniversary Half Cab Pro is now available at Metallica’s website here.